Dying for Chocolate: HAVE YOUR CAKE AND EAT YOUR CANDLES, TOO! HAVE YOUR CAKE AND EAT YOUR CANDLES, TOO! Who doesn't want to have a totally edible cake, complete with edible candles? I do!! That's why I was thrilled to hear about these scrumptious candles that Lorree Sandler has created! Thanks to my friend and mystery author Sharon Fiffer for the tip! Love when my mystery and chocolate worlds collide! Making a wish and blowing out a candle seals the birthday deal. Even in a crowd, we get a teeny tiny spotlight, and the rest of the world disappears while we hold our breath, close our eyes, dream. Of course, a killer dessert is a must as well. Maybe a cake covered in roses for grabby little hands, or a single cookie to be broken into bits by friends who are all on diets. With Let Them Eat Candles, the putrid wax middleman has been eliminated. So 21st century – save a step, cut to the chase. Slender sticks of premium chocolate, affixed with a wick, offer an additional treat for grabby little hands, or an elegant escape from the cookie conundrum. Edible candles – so obvious, right? Why haven’t we seen them before? I can offer only my own experience, a journey of 2 1/2 + years from idea to market. Loving chocolate is a far cry from working with it. At The French Pastry School and the Chocolate Academy (both in Chicago) I learned about tempering, moulding, packaging. I was introduced to enrobing machines, raplettes, guitars for cutting ganache. I learned about cocoa butter finishes, mouth feel, transfer sheets. Without existing chocolate candle moulds on the market, I had to design mine and get them built. My finished product couldn’t be shoved into simple boxes like their waxy cousins, they needed to be separated and seen – custom packaging. There was patent research, filing a patent application. I needed food safety certification, rentable commercial kitchen space (where ovens weren’t a-blazing). I needed graphics, a website, supplies. There was a lot of experimentation, tiny victories, major setbacks. There were chocolate varieties to be tasted and tested, trade shows to attend, contracts to sign. “You should go on Shark Tank,” I hear again and again. I’d love to, I know, I will! Believing in chocolate candles, and in my ability to bring them to life, has been a lot of blind faith, some lucky breaks, and more than a few crying spells. Even though thousands of these beautiful babies will have to be sold before I begin to recoup my investment, I do believe I’m onto something. Let Them Eat Candles belong in a bakery (or a restaurant, or a big box) near you! Visit www.marthastewart.com/americanmade and look for Let Them Eat Candles in the Sweets & Baked Goods subcategory of the FOOD section. If you vote between September 15 and October 13th, then at my (BIG) birthday, on October 15th, I could wish for more moulds, a dedicated production facility, and more hands on deck, and I might have a prayer of it coming true! 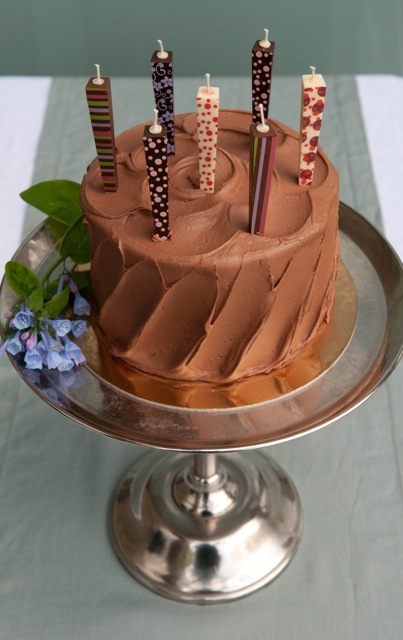 Wouldn’t you like to wish on premium chocolate candles at your next celebration? Thank you, Janet Rudolph, for giving me space to share my story. And thank you, Dying for Chocolate readers, for your desire for the delicious. I just saw chocolate number candles in a store in PA. They looked like the big wax number candles but were made of chocolate. I wonder if those were yours? Sorry for delayed response - just saw your question. The chocolate numbers you saw were ahem, not mine. I will certainly check them out if I can find them. Thanks. Retro Rum Fudge: National Rum Day! Weird News: Chocolate Chip Cookie Crime! S'mores Ice Cream Sandwiches and more!